Samsung has been teasing with “Exynos Infinity” before Mobile World Congress 2014, and many expect the Korean company to announce their 64-bit mobile processor (Exynos 6 ?). But it’s likely another Exynos SoC will (also) be announced, as a quick search shows recent patch submissions for Exynos 5260, which happens to be an hexa-core processor using two ARM Cortex A15 cores @ 1.7 GHz, and four ARM Cortex A7 cores @ 1.3 Ghz in big.LITTLE configuration supporting HMP (Heterogenous Multi Processing) / GTS (Global Task Scheduling). The official name might be something like Exynos 5 Hexa (5260). 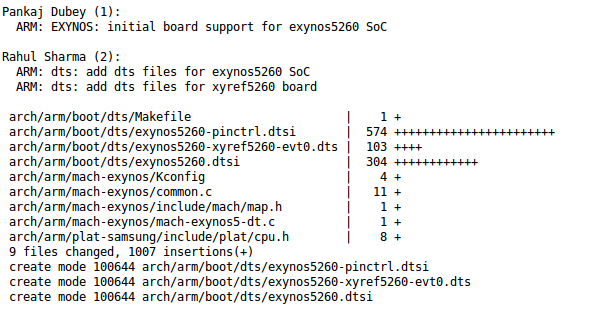 There’s also a device tree file for Samsung XYREF5260 EVT0 development board. It would probably be possible to go through the patches to find out more, but there’s an easier solution, and some blogs have already posted details about a leak showing Exynos 5260 used in the upcoming Galaxy Note3 Neo, where we learn the GPU is an ARM Mali-T624. The mobile phone itself boasts a 5.5″ display @ 1280×720, 2GB RAM< 16Gb Flash, an 8MP rear camera and 2.1 MP front camera, and a 3,100 mAh battery. Reports indicate Android 4.3 is currently running on the device, but that it should be eventually be upgraded to 4.4. The phone gets 29,3282 points in Antutu 4.x, just below Samsung Galaxy Note 3 powered by the more powerful Exynos 5 Octa 5420 or Snapdradong 800. Well this one seems pretty obvious to me. An A7 uses much less power and is much easier to build ( significantly less transistors ). The idea behind this SOC seems to be to make something lower cost than the octa one and leaving out 2 A7 core wouldn’t have made much impact. Leaving out 2 A15 ones actually does. 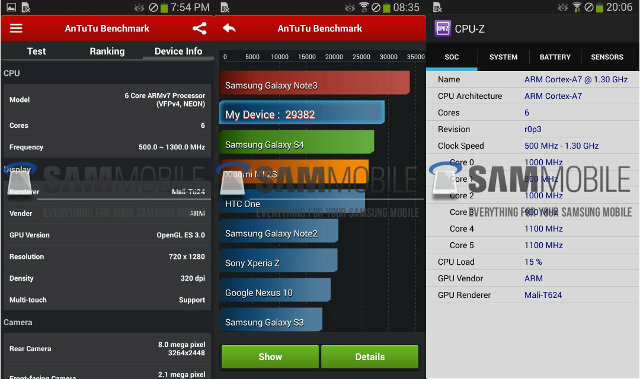 Also interesting is that from what I’ve seen the A7 cores are actually provide more performance/ W that A15 cores even though their peak power is not that great. Indeed they can but so can the A15s. I think the main reason here was keeping the transistor numbers down and A15s use a lot more than A7. An added benefit is that A7 are more power efficient. In theory 8 A7s would be even better as far as performance and power consumption goes but you do need something to have 8 threads. The only thing the A15 is really good for is if you need great performance / thread. This is also, as far I know, the first Samsung SoC, managing LTE, this was until now, the reason, Samsung used Snapdragon for US version and Exynos for the World. Now, LTE is accessible everywhere in Europe and lot of place elsewhere, The Galaxy 3 neo, should be the first mobile phone with Exynos managing LTE :). @Popolon except that the Galaxy S3 and the Note 2 had LTE. Also many Korean versions. The Exynos/LTE problem is a fabricated one. Exinos can probably support LTE just fine but it needs an added modem whereas Qualcomm SOCs have it in the main chipset. This is what I know but I might be wrong.